People often act in order to realize desired outcomes, or goals. Although behavioral science recognizes that people can skillfully pursue goals without consciously attending to their behavior once these goals are set, conscious will is considered to be the starting point of goal pursuit. Indeed, when we decide to work hard on a task, it feels as if that conscious decision is the first and foremost cause of our behavior. That is, we are likely to say, if asked, that the decision to act produced the actions themselves. Recent discoveries, however, challenge this causal status of conscious will. They demonstrate that goals themselves can arise and operate unconsciously - actions are initiated even though we are unconscious of the goals to be attained or their motivating effect on our behavior. Social situations and stimuli in the surroundings activate or prime goals in our minds outside of our awareness, thereby motivating and guiding us. Figure - The proposed mechanism for unconscious goal pursuit. Neuroimaging research has discovered that reward cues are processed by limbic structures such as the nucleus accumbens and the ventral striatum. These subcortical areas play a central role in determining the rewarding value of outcomes and are connected to frontal areas in the cortex that facilitate goal pursuit. These reward centers in the brain respond to evolutionarily relevant rewards such as food and sexual stimuli, but also to learned rewards (such as money or status), or words (such as good or nice) that are associated with praise or rewards. This demonstrates that regardless of their shape or form, such positive stimuli induce a reward signal that is readily picked up by the brain. Other recent research has demonstrated that subliminal primes that are specifically related to rewards can motivate people to increase the effort they invest in behaviors. In one study, participants could earn money by squeezing a handgrip. Before each squeeze, the money that could be earned was indicated by a 1-pound or 1-penny coin on the screen. Whereas on some trials the coin was clearly visible, on others it was presented subliminally. Thus, effects of conscious and unconscious reward cues could be compared within one experiment. It was found that people squeezed harder on high than on low reward trials, regardless of whether the reward was consciously visible or not. 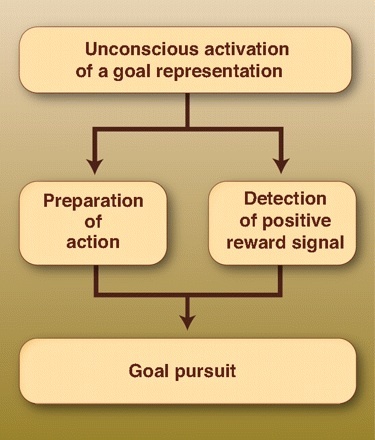 Moreover, this effect was accompanied by activation in the brain areas that play a role in reward processing and the recruitment of effort for action…These findings indicate that conscious and unconscious reward cues have similar effects on effort and flexible cognitive processing, which suggests that conscious awareness of rewards is not needed for goal pursuit to occur. That figure is ok but it seems to be missing the "Make up a story about it" box.